I’ve got quite the skincare collection, but nowhere near as extensive as most beauty bloggers nowadays. I hate having too much ‘stuff’ so typically I’ll have a few key products and aim to use these up before I purchase new ones. I bloomin’ love being a bit nosey and seeing what’s lurking in people’s bathroom cabinets, so today I thought I’d share what’s lurking in mine! 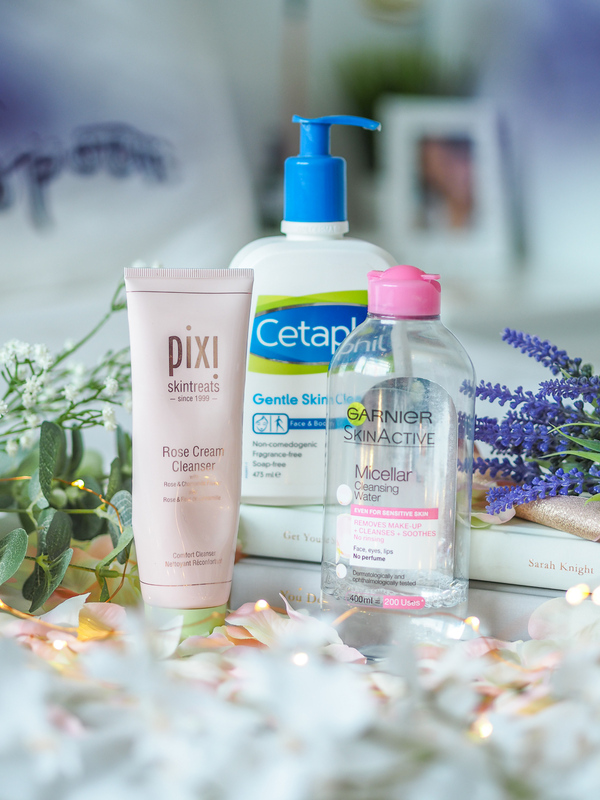 These are all the products I use for my skincare right now – some products I’ll use daily, some I’ll use weekly or some will just be when I fancy it. 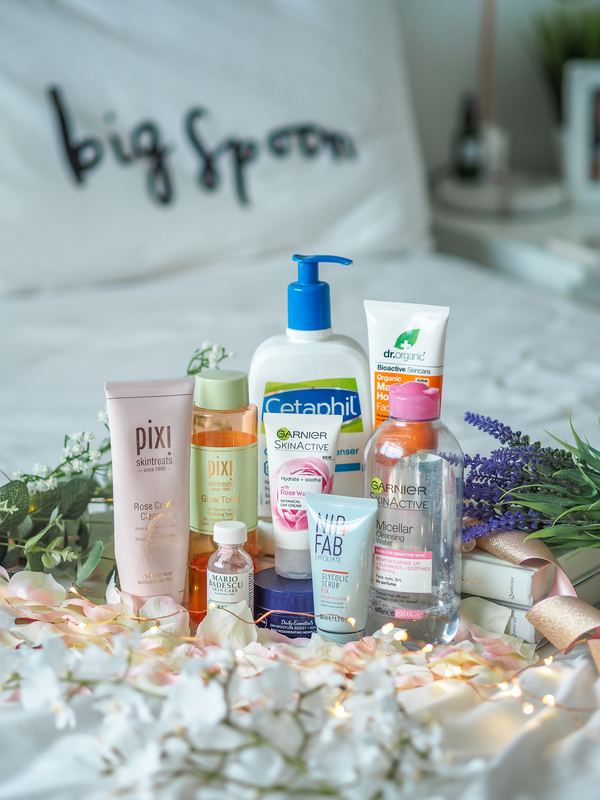 But these products are the majority, and the main items I use on a weekly basis in my skincare regime. Starting off in a logical order, there are 3 key cleansers I use. 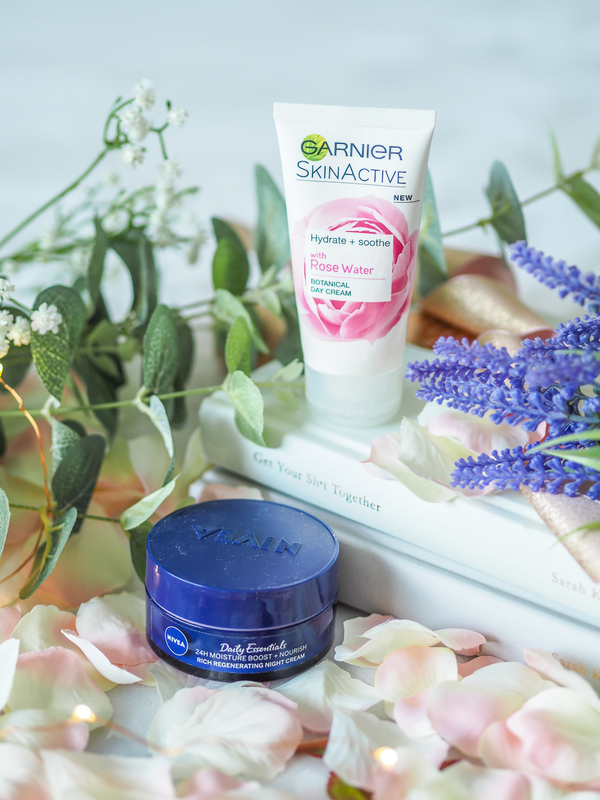 The Cetaphil Gentle Cleanser, the Pixi Rose Cream Cleanser, and the Garnier Micellar Cleansing Water. 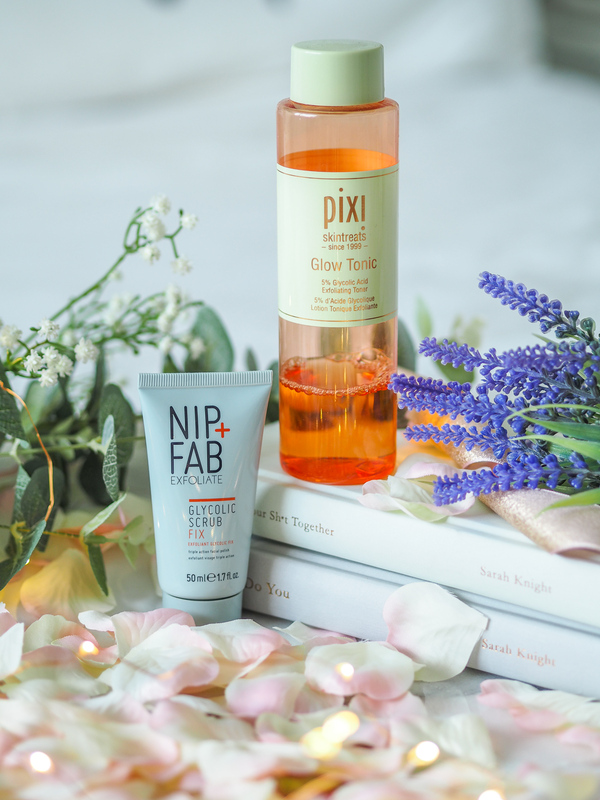 Every morning I’ll use my the Pixi cleanser just to freshen up my face, get rid of oils that have built up overnight and prep my face for makeup. I’ll use a small dollop, rub it over my face and rinse off with water. See a full review of this here. In the evening I’ll do a double cleanse, starting with the Garnier Cleansing Water. I switched back to this recently after running out of my favourite Clinique Cleansing Balm, and was reminded why this was always such a firm favourite. It’s super cheap and does a stellar job of removing my day-to-day face. Despite that, it doesn’t quite get rid of every bit of make-up. That’s why I then move onto my second cleanse with the Cetaphil Cleansing Balm. This has been in my collection for a good few years now and I really believe this helped clear up my skin a while back. I stripped my routine back to the basics as this is a really gentle product for the skin. I tend to use a pump or two of this in the shower every night just to ensure every bit of dirt and grime is cleared! The second stage, both day and night, is exfoliating. For this, I’m using my Pixi Glow Tonic and my Nip and Fab Glycolic Scrub Fix. In the mornings I use the Glow Tonic after I’ve cleansed with the Pixi Rose Cleanser just to reduce my pores and really firm up my skin. Then in the evenings, I’ve been using this scrub from Nip and Fab. I got this in a recent Glossybox so I’ve been giving it a whirl. It’s nothing special but does the job when I want a bit of extra exfoliation after my night time cleanse. I don’t like to use this every night though – I feel exfoliating every night can be a bit too harsh on my skin! Just like exfoliants, I’m currently using two different moisturisers for day and night. For daytime I’m using Garnier’s Botanical Day Cream, and for the night I’m using Nivea’s Rich Regenerating Night Cream. I bought both of these earlier on in the year in a random Superdrug order simply because they were both super cheap and I was living on student wages back then! Both under a fiver, they seemed well worth a go. I’ve found I’ve preferred the day cream, which I’ve been using after I’ve toned. This is my second tube of it – it seems to moisturise my skin the perfect amount – not too much considering I’m about to apply foundation, but just enough to cover up any dry spots. It works really well as a base for my make-up. The night cream I’m not such a big fan of. It’s a really rich and creamy texture, which I suppose comes into play with it being regenerating and made to be applied for overnight, but for me, it just feels a bit too heavy at times. Nonetheless, I’m still using this at night because waste-not-want-not and all that! Finally, the treatments. 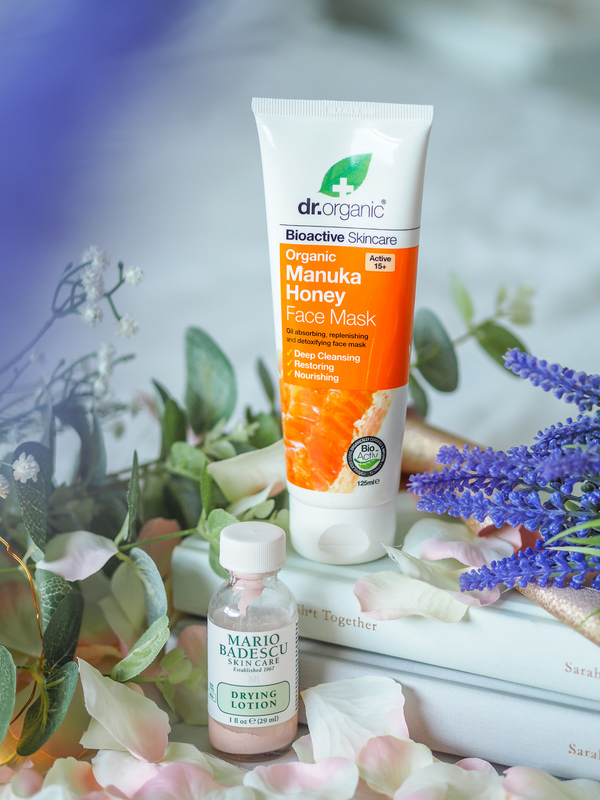 The two key products in treating my skin 2-3 times a week right now are the Dr. Organic Manuka Honey Face Mask and the Mario Badescu Drying Lotion. Although I often switch up my face masks, the key one in my skincare routine right now is this Manuka Honey one from Dr. Organic. I think my mum got this a while back, but I’ve found it to really deliver results in clearing my skin up when it’s having some troubles. It draws out impurities and leaves my face fresh and almost instantly clearer! I try to use this at least once a week when I have a good pamper. The second saviour has to be the Drying Lotion from Mario Badescu. This has been praised a lot in the blogosphere, and when Beauty Bay sent me a bottle I wasn’t sure whether it would live up to expectations. But let me tell you, boy oh boy it does. I use this on any spots that seem to appearing overnight, and for the most part, it reduces them or even get’s rid of them entirely. This has been an absolute god-send, I just wish I had found it sooner! 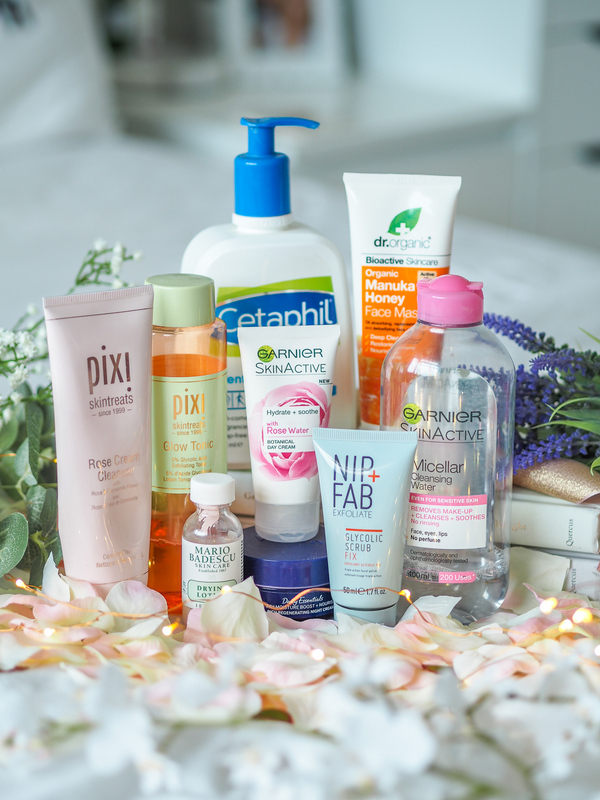 And that’s the lot – everything in my skincare collection right now. How does my collection compare to yours?